Do You Need a Curved Stair Lift? There are two basic types of stair lifts – straight and curved. You will need a curved lift if your staircase curves or takes a turn before it reaches the next floor. Curved stair lifts use custom-built tracks that are designed to fit your staircase, which allows you to travel up and down any staircase in your home. Your curved stair lift will be crafted to the exact specifications of your stairway to provide easy access to upper floors while adding to your home’s character. It can be installed on virtually any curved stairway, with the flexibility of mounting on either side of a staircase. Curved stair lifts can be installed in older and newer home models and can be designed for steep stairs with a gradient up to 75°. Curved stair lifts will go around corners, bends, and changes in direction but are much more expensive than straight stair lifts, usually costing between $10,000 and $15,000, compared with $3,000 to $5,000 for a straight stair lift. Curved stair lifts come with a 400-pound weight capacity with a seat width of 21.5″ to fit a range of body types. A generous seat size with adjustable width arm rests and multiple seat heights with an offset swivel seat make entering and exiting at the top landing safe and easy. They feature a vertical rail design that allows family members ample space on the staircase with arms, seat, and a footrest that flip up to create space for additional users of the staircase. Curved stair lifts are powered by a direct drive motor/gear box. 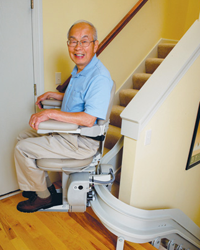 The curved stair lift operates by plugging into your household outlet. Two 12-volt batteries allow the stair lift to operate during a power outage. A curved stair lift comes with a number of color options, including brown, maroon, charcoal, and olive vinyl. You can choose separate colors for the seat, the stair lift, and the rail of the stair lift. 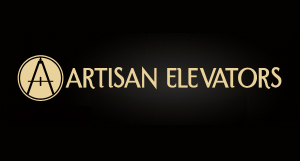 Look online for stair lift providers that offer curved models that are customized to your home. The design process takes additional time, but you can have a curved stair lift installed within a few weeks.